PracticeLink.com W INTER 2019 59 the Q uality of life issue The patient comes first at Summit Health, but the organization also focuses on the well-being of the staff and team. Everyone is valued and important. 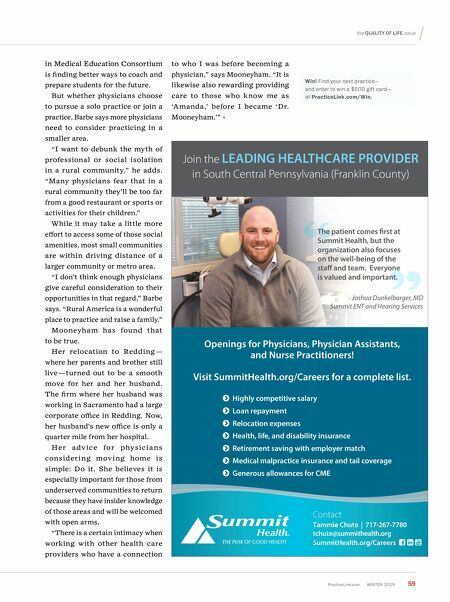 - Joshua Dunkelbarger, MD Summit ENT and Hearing Services Openings for Physicians, Physician Assistants, and Nurse Practitioners! Visit SummitHealth.org/Careers for a complete list. Highly competitive salary Loan repayment Relocation expenses Health, life, and disability insurance Retirement saving with employer match Medical malpractice insurance and tail coverage Generous allowances for CME Join the LEADING HEALTHCARE PROVIDER in South Central Pennsylvania (Franklin County) Contact Tammie Chute | 717-267-7780 tchute@summithealth.org SummitHealth.org/Careers in Medical Education Consortium is finding better ways to coach and prepare students for the future. 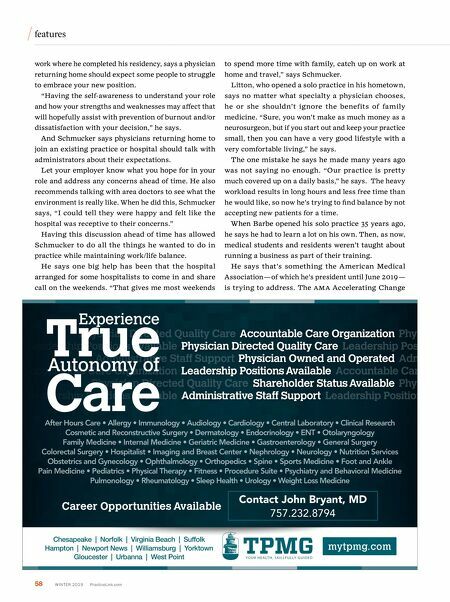 But whether physicians choose to pursue a solo practice or join a practice, Barbe says more physicians need to consider practicing in a smaller area. "I want to debunk the myth of professional or social isolation in a rural community," he adds. "Many physicians fear that in a rural community they'll be too far from a good restaurant or sports or activities for their children." While it may take a little more effort to access some of those social amenities, most small communities are within driving distance of a larger community or metro area. "I don't think enough physicians give careful consideration to their opportunities in that regard," Barbe says. "Rural America is a wonderful place to practice and raise a family." Mooneyha m has fou nd that to be true. Her relocation to Redding — where her parents and brother still live — turned out to be a smooth move for her and her husband. The firm where her husband was working in Sacramento had a large corporate office in Redding. Now, her husband's new office is only a quarter mile from her hospital. Her a dv ice for physic i a n s consider i ng mov i ng home is simple: Do it. She believes it is especially important for those from underserved communities to return because they have insider knowledge of those areas and will be welcomed with open arms. "There is a certain intimacy when working with other health care providers who have a connection to who I was before becoming a physician," says Mooneyham. "It is likewise also rewarding providing care to those who know me as 'Amanda,' before I became 'Dr. Mooneyham.'" Win! Find your next practice— and enter to win a $500 gift card— at PracticeLink.com/Win.